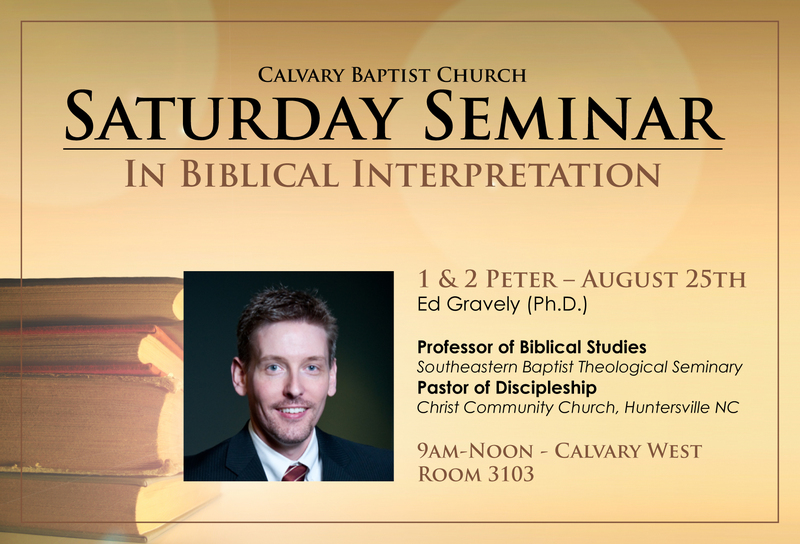 It’s time for another Saturday Seminar at Calvary! If you are a Bible Fellowship teacher, part of a Bible Fellowship teaching team, or just love to study the bible, you will not want to miss this training opportunity to learn from one of our Southeastern Baptist Theological Seminary professors! Dr. Ed Gravely will be at Calvary on Saturday, August 25th from 9am-12noon. Dr. Gravely will be walking us through 1 & 2 Peter. Dr. Ed Gravely is professor for Biblical Studies, History of Ideas, and is the Coordinator for the Charlotte Extension Center of Southeastern Baptist Theological Seminary in Wake Forest, NC. Gravely earned a Ph.D. from SEBTS with a focus on textual criticism. Dr. Gravely also serves as pastor for Discipleship at Christ Community Church in Huntersville NC.